You know, because I obviously have WAY too much free time. Koginzashi こぎん刺し (or according to various online translations, “concentrated silver stab”) is a regional stitch technique that evolved out of its plain but fascinating older sister, sashiko刺し子. By carefully counting the warp and weft threads of a piece of cloth, a pattern could be devised to protect the wearer both physically (for warmth and heavy-duty wear) and spiritually, including designs to ward against bad fortune. In the Edo era, when farmers and peasants were not permitted to wear cotton as it was reserved for the samurai class, they resorted to readily available linen and other bast fibers to stay warm. Fortunately these bast fibers grow well in the northern regions where cotton could not be grown. Unfortunately they aren’t as effective at retaining heat as cotton, so the use of extra thread sewn in such a way along the weft of the fabric as to appear woven in made the clothing much warmer and softer. Many older pieces are done with white thread on indigo dyed fabric, producing striking geometric images primarily based on diamond shapes. Working with an Olympus kogin kit for a pincushion, I found myself struggling with the instructions and had to start over a few times. Once I got the general concept, it was really quite simple and enjoyable. The kit comes with everything you need to start, including fabric, a pack of polyester batting to stuff the pincushion, a needle, and more than enough thread. Instructions are in Japanese, but I have an English translation if you need it. It’s not the best translation, but it does help. I unpacked the kit and added two books on the subject. Those first three stitches took me 10 minutes to figure out. I hope what follows will help you to better understand kogin and save you a few headaches. The books shown here are available through various online sources including Etsy and Kinokuniya. If you search for “kogin” or “こぎん刺し” by copying and pasting that into your browser, you will find some very inspiring images and books. The Olympus kit was somewhat cryptic in that it said to start in the middle of the project. Not just the middle line, mind you, but in the center of that middle line. Why? As I went along it all made sense. 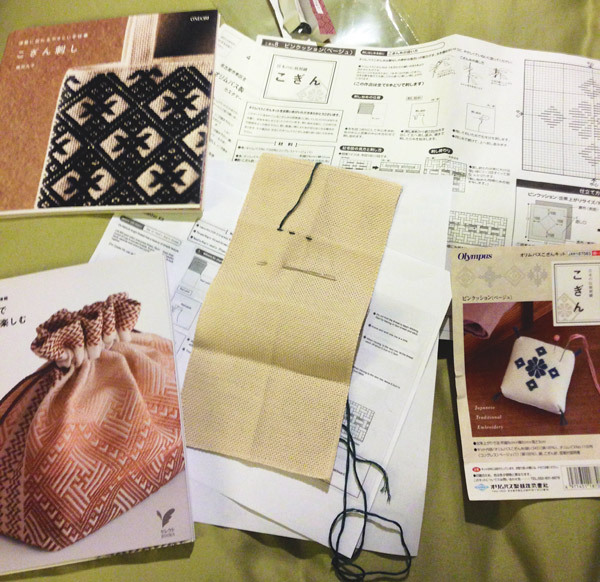 The fabric is not marked, as it is in the Olympus sashiko kits. Here the instructions say to cut the small rectangle of included fabric in half and fold one square into quarters. The creases will show you where the center is, and I have marked that with lines in the photo here. 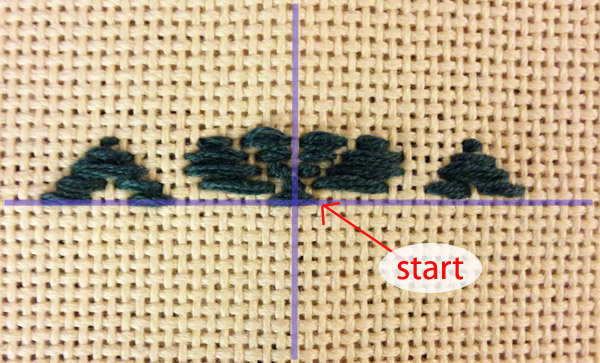 The first stitch covers three warp threads, and moves to the left. Note that to the right the little pyramid is missing its bottom stitches because we haven’t gotten there yet. If you start in the middle of everything, it helps the rest of the pattern fall into place very neatly. From the back you can see the tail of the first stitch. It is suggested that you leave 10cm of thread there, but once I finished the kit I wondered if I could have left half of the starting thread. It really didn’t take much thread at all to do the top half of the design. 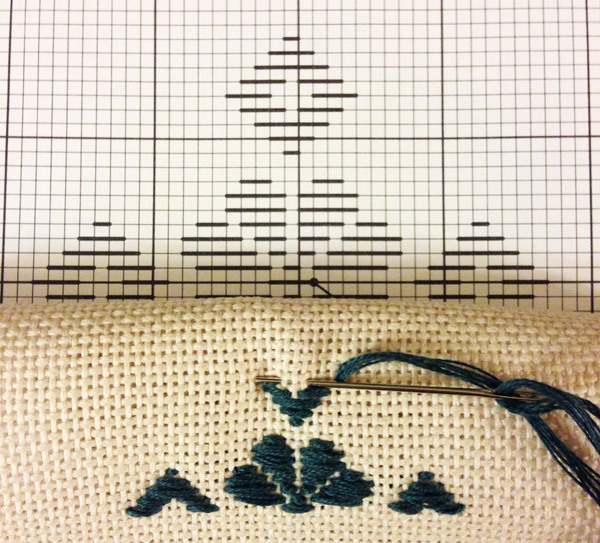 As it is, you will need that long tail to complete the line later, so make it 10cm (4″) or longer if you like. I backstitch instead of making knots, so extra thread for backstitching is always appreciated. Once you come to the end of the row, you go up a weft thread and move to the right, continuing the design. After a few rows it becomes easier to anticipate where the next stitch will be, and then you’ll find an easy pace. At least I did. 15 minutes of frustration became a pleasant hour or so of stitching, and the result was quite rewarding. 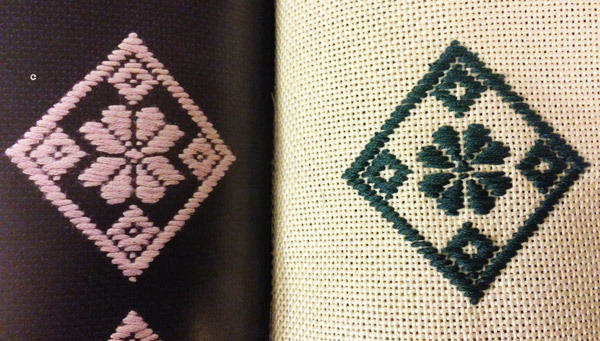 The pattern in the kit is very sweet, but I had seen something a little more interesting in one of the books I had on hand, so I went ahead and added a border as an afterthought. Several kogin kits and supplies have recently been added to the Kimonomomo Etsy shop, and I hope you will find a new diversion for yourself there. More thread colors will be added as soon as I edit the photos, and more kits are coming from Japan later this month. If you have requests, please let me know. I love kogin so beautiful. I have tried once for a while. Always the pattern came up and wowed me. Very interesting history, and the designs are beautiful. Looks like a fun project!